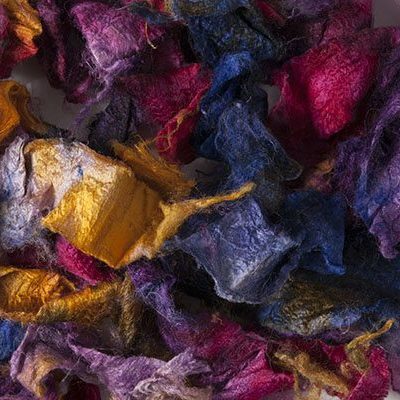 These hand-dyed ‘silk Flats and Curls ‘ are really split down silk carrier rods. This means that as most applications of silk rods require the splitting of the rods, you may not need to bother. It is still possible to split the pieces into thinner layers in many cases if you need to. This product is great for use with an embellishing machine, or for needle felting as the pieces are all of different interesting shapes shapes and thicknesses. The flats and curls are hand-dyed in a range of named multi-colours, which give an indication of possible application, but of course, its up to you !